During the two very long hours of Anchorman 2: The Legend Continues, I think I chuckled three times. Meanwhile, all around me were cracking up. 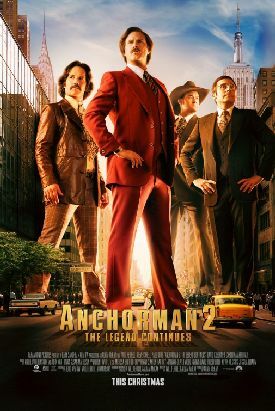 They, obviously, were more in tune with the general audience responsible for (at the time of writing) the $100 million in box office receipts earned by this sequel to the equally dreadful Anchorman: The Legend of Ron Burgundy (2004). Not that I’m not used to being in the minority in my view of popular movies, but I can’t help asking myself why so many people think this one, which is by the same creative team of Will Ferrell and Adam McKay that produced the original, is funny when I do not. I don’t think it can be because I lack a sense of humor, or that it has atrophied with age, since I do laugh at quite a lot of things. Scott Foundas, the critic for Variety likens the new Anchorman to "Network as directed by Mel Brooks, and starring Gene Wilder," thus comparing it to some movies that I do find funny. Does he, then, think they are funny in the same way as Anchorman 2? I doubt this. The Brooks-Wilder team appealed to a common culture in a way that movies can’t anymore. Mr Foundas also calls the Anchorman franchise "a cherished cultural totem" — to which the only possible answer is "not in my culture." But then that’s the point. It’s the common culture that we’ve lost. In the days of The Producers or Blazing Saddles or Young Frankenstein the contemporary audience still imagined it was laughing at a plausible version of reality — even if it was only, as in the case of the second and third of these, a movie reality. The old-fashioned Western (Blazing Saddles) or horror flick (Young Frankenstein) may have been an easy target for 1970s sophisticates who were not at all like their contemporary, Ron Burgundy, but they were enjoying Mr Brooks’s making fun of things, not originally intended to be funny, whose latent absurdity more or less everybody by then was able to recognize. It’s not like that in Anchorman 2. It is meant to be, at least in part, a satire of cable news shows at the moment of their debut on the national scene in the early-1980s, but there is nothing latent about their absurdity here. It is so far over the top that the shows, like Ron Burgundy (Mr Ferrell) himself, no longer resemble anything in nature — certainly nothing that we can imagine anyone ever could have taken seriously. There was the merest hint or suggestion of plausibility ten years ago when Ron and his idiot friends Brick Tamland (Steve Carell), Champ Kind (David Koechner) and Brian Fantana (Paul Rudd) were local news-sports-and-weathermen in the provincial setting of San Diego, though San Diegans might have been justified in denying it. But on the national stage they lose all tether to reality except for those who wish to flatter themselves by seeing them as a straightforward parody of Fox News. We’ll come back to them in a moment. For the rest of us, the fantasy can be open and unashamed because the Hollywood convention which has grown up in the thirty years since Ron allegedly walked the earth is that fantasy is now self-sufficient and owes nothing to reality. It is, in fact, a new, private reality that we may share in if we like. Lots of people do like. Thus Mr Foundas, mentioned above, also writes of how dumb-as-a-Brick is "first seen hilariously eulogizing himself at his own funeral." What’s hilarious about that? A living, breathing, talking man who doesn’t know he isn’t dead? Not only is there no such person but we cannot even imagine such a person except by transporting ourselves (or allowing ourselves to be transported) to the realms of pure fantasy. But absurdity, it seems to me, can only be amusing by contrast with something real and non-absurd — the straight man in whose face the cigar explodes is as vital to the joke as the cigar itself. Where everything is absurd the absurd ceases to be funny. Or at least I would have thought so. Of course it may be that those who find it funny do see (or imagine they see) something real of which Ron and Co. are an exaggeration. Mr Foundas, again, sees Ron Burgundy as prefiguring Bill O’Reilly while Richard Corliss of Time sees the Aussie head of the new cable news network, GNN, the young, blond, clueless Kench Allenby (Josh Lawson), as a persuasive version of Rupert Murdoch. I can’t see it myself, but for such people the movie could be a way of thanking God they are not as these others, these cultural and intellectual inferiors who imagine they belong in the world of the elite. Anchorman 2 is thus be a satire in the same way that "Doonesbury" is satire. Both try to think up the most appalling examples of stupidity they can and then attribute these, as if they were real, to those whom they seek to exclude from the favored elite they themselves belong to. And the way you show you, too, belong to the elite and not to whatever grubby little wannabe clique you despise is to laugh. Even if this were true, however, it could hardly account for all the millions who will see this movie and be glad that they did. Maybe the rest are just flattered by their implied inclusion in the company of those presumed to be intelligent enough to know stupidity when they see it. There is one moment in the movie in which Kristen Wiig — whose character is the love-interest for Brick and who is supposed to be even stupider than he is — is being berated by her boss at the cable network. "You are the dumbest person I have ever met in my whole life," says the boss. "And I’m not exaggerating." No, no. No exaggeration here. But if this is a feeble attempt at a pomo joke — always supposing there are any pomo jokes that aren’t feeble — it is also meant to point us to the fact that the film-makers know they are exaggerating, honest they do, but they remain just a little bit nervous that we, the audience, might be as dumb as Ron Burgundy (or Miss Wiig’s character) and not know this. And, when you think about it, they must have had a pretty mean opinion of the intelligence of the general public if they think it could ever have made Ron Burgundy the star he is supposed to be. Ron must therefore be, among other things, an invitation to the dummies to prove, by laughing at him, that they’re not so dumb after all. In the same way, we are shown one scene in which several of the really dumb dummies in the movie are shown reading Garfield at Large and laughing uproariously. There, you see, is something that’s presumed to be unfunny — unless you’re the kind of dummy that finds it funny. You’re not, are you? You can prove it by laughing at the dummies who laugh at "Garfield," the sight of whom, laughing, must be a funny thing to people who suffer from status anxiety about being stupid themselves and seek to prove their intelligence by laughing at stupid people, even when they aren’t doing anything particularly funny. The setting of the "legend" in the past of 30-plus years ago is also crucial to the success of these movies. They belong to what the critic Mark Greif, a propos of "Mad Men," once called "the genre of Now We Know Better." Those fools in old-style hats and coats — or moustaches, stop-sign red blazers and wide ties — are immune to the pain of their own ridiculousness because they are past. Long gone. They may even have been us, once. But now we can safely laugh at them, and remember them as even stupider than they were, because we have moved on. We’re not the same people anymore. We’re much, much smarter now. That is a conceit absolutely basic to the progressive world-view. And how do we know that we’re so much smarter? Well, at least in part by laughing at the exaggerated stupidity of our former selves — or those who, like our former selves, didn’t know how ridiculous they were. A hundred years ago, P.G. Wodehouse, followed by various screwball comedies, depicted members of the upper classes of the time as incorrigibly if usually rather lovably stupid and utterly dependent on their servants and others from the much cleverer lower orders to get them through their undemanding days and solve their trivial problems. I take it that the savage criticisms from the left of "Downton Abbey" — which often serves as a corrective to that meritocratic model — is one indication of how deeply the progressive worldview depends on this now long-outdated paradigm. The Anchorman movies, which have their origins in Brick-like Ted Baxter on the old "Mary Tyler Moor Show," could be seen as an attempt to recreate the same paradigm for the era of the celebrity culture — except that the celebrity culture will always resist parody by being a parody of itself. You only have to look at the climax of Anchorman 2 (insofar as it can be said to have such a thing) wherein a veritable Who’s Who of Hollywood puts in cameo appearances in a bizarre attempt by the celebs to associate themselves with a supposed satire of celebrity and the media culture which is built on it. Their laughing at themselves gives us permission not only to laugh at them too but also to admire them even more on account of their being able to laugh at themselves, thus confirming them in their celebrity status. That I don’t find this funny is just one indication of my own idio-culture, which I foolishly (perhaps) try to keep pristine and uncontaminated with the idiot-culture of celebrity, especially when it attempts to ingratiate itself with me by locating and isolating for my benefit some other idiots, albeit fantastical ones, whom we may both hold in contempt. Yet I don’t seem to be able to help myself, since I don’t know how to do what the makers of Anchorman do and despise a fantasy.